Tron Evolution is a movie tie in game which instead of trying to mimic the actions of the film favours telling the backstory of events prior to it. This means you get to see how things take a turn for the worst for Kevin Flynn and should offer a little more insight if you go watch the movie again or for the first time. The original movie ‘Tron’ and subsequent arcade game was made in the early 80s written and directed by Steven Lisberger. It starred Jeff Bridges as the protagonist hacker Kevin Flynn – who also reprises his role for the latest movie and game. Movie aside, and under the wing of Disney’s own publishing, comes this latest game, and one that offers some well replicated visuals and a soundtrack to die for. However, beyond the obvious appeal to the fans of the movies, how well do the offerings of the game hold up for the rest of us? 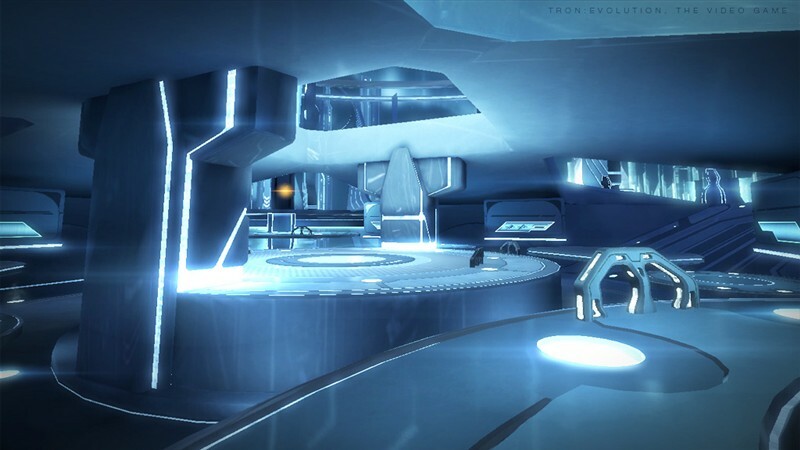 Tron Evolution offers up a straight up platformer whereby you’re required to navigate linear paths by running, jumping, vaulting and combining those moves to get from A to B, meanwhile the plot lingers in the background to provide some cohesion to simply going from room to room. The athletics work reasonably well as you hold down the right trigger to enter the action mode allowing you to run along walls and perform those all important leaps. Aside from a few issues with the camera, the navigation aspect is reasonably solid, with very little puzzle solving involved. Your path is always quite clear, and if stuck, a press of the back button will guide you forwards with a marker. There’s some cool sequences on offer, especially when you get the timing just right, although more often than not you’ll come a cropper because you didn’t jump high enough, or at the correct angle. Moments of frustration can occur, but overall the controls are tight enough to provide a thrilling ride through the Grid. Another major aspect of the gameplay lies in combat with other programs, and it’s here where you’ll get to throw your disc for ranged attacks, and get in close with your fists for those more intimate moments. With several disc upgrades available as you progress through the story, gaining XP as you go, you’ll find a variety of attacks suited to the various opponents along the way. Luckily you’ll get a scan message with each new encounter informing you of their potential weaknesses. The levelling up aspect is decent enough, and provides a good motivation for tireless hacking away at room after room of enemies. Sometimes, progression is halted until you’ve cleared a room of hostiles completely. There’s probably about 50/50 combat and navigation, just enough to not get too stale however, some extra moves, more varied enemy types could have made the combat less repetitive. On occasion you’ll enter the rather cool cycle or tank, but the controls for these are more fiddly than intuitive and means the enjoyment factor is lower than expected. The tank especially handling so cumbersome that it often won’t turn on the spot resulting in death and a restart. Luckily the game is fairly forgiving in this regard, but it still grates all the same. There’s some impressive and highly atmospheric visuals on offer with it’s two tone colour schemes and complete futuristic look. Sadly, and much like the movie, the enthralling nature of the visuals wears thin after a while and you’re left looking at a very flat and unvaried game. There are some other issues as well, such as stiff , repetitive and robotic animations, cheap AI and a dodgy camera which doesn’t help matters when you’re in the thick of it. Some of the encounters are cheap, tipped in the computer’s favour with you left wondering how to overcome. There’s a fair bit of trial and error, which sadly really does take you out of the game. The audio fares much better and offers some excellent electronic sounds to compliment the environments. Sascha Dikiciyan, Cris Velasco and Kevin Manthei do a marvelous job of capturing the feel of the movie, conveying the expanse of the grid with the right blends of drawn out chords and sharp effects. The voice acting is of a reasonable standard, although Mr Bridges is absent from the cast despite Oliva Wilde performing as her character Quorra from the film. With a story that can be completed fairly quickly, the only real incentives to play again are to find the collectibles and level up you character so as to acquire all the upgrades. For those of you looking to get competitive, then there are some multiplayer modes on offer, comprising of the usual modes set within the Tron universe. For lone players, there’s the option to play DeathMatch versus bots, but these get stale quickly especially as your options are limited. Taking the game online, and the issue becomes more about finding players rather than the modes on offer themselves. Tron Evolution is a game designed to appeal to fans of the movie as it does a good job of filling in any blanks you might have had after watching. The gameplay is fairly basic and somewhat repetitive, but with patience, you’ll probably be drawn into the Grid and find enjoyment from derezzing programs from start to conclusion. The platforming elements are welcome, but feel a bit too rigid and could have benefited from a more open approach – as hinted at during the opening. Anyone who isn’t a fan and is looking for a break from the norm, then this should certainly be rented first. Cool visuals, excellent soundtrack, average gameplay – you decide what’s important.